Yaghoubi, A., Asghari, M. (2016). Designing a New Multi-objective Model for a Forward/Reverse Logistic Network Considering Customer Responsiveness and Quality Level. Journal of Industrial Engineering and Management Studies, 3(2), 88-106. A. Yaghoubi; M. Asghari. "Designing a New Multi-objective Model for a Forward/Reverse Logistic Network Considering Customer Responsiveness and Quality Level". 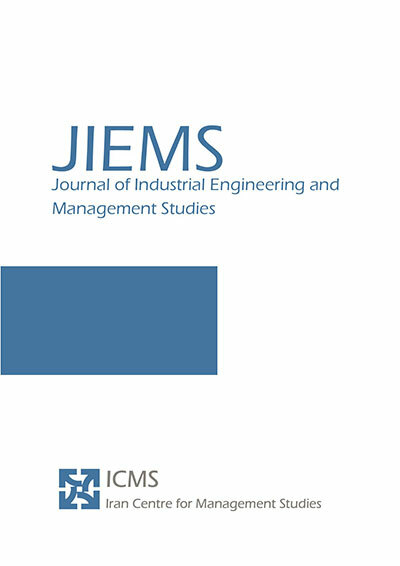 Journal of Industrial Engineering and Management Studies, 3, 2, 2016, 88-106. Yaghoubi, A., Asghari, M. (2016). 'Designing a New Multi-objective Model for a Forward/Reverse Logistic Network Considering Customer Responsiveness and Quality Level', Journal of Industrial Engineering and Management Studies, 3(2), pp. 88-106. Yaghoubi, A., Asghari, M. Designing a New Multi-objective Model for a Forward/Reverse Logistic Network Considering Customer Responsiveness and Quality Level. Journal of Industrial Engineering and Management Studies, 2016; 3(2): 88-106. 1Department of Industrial Engineering, Raja Higher Education Institute, Qazvin, Iran. 2Department of Industrial Engineering, Kar Higher Education Institute, Qazvin, Iran. In today’s competitive world, the need to supply chain management (SCM) is more than ever. Since the purpose of logistic problems is minimizing the costs of organization to create favorable time and place for the products, SCM seek to create competitive advantage for their organizations and increase their productivity. This paper proposes a new multi-objective model for integrated forward / reverse logistics network including three objective functions which belongs to the class of NP-hard problems. The first objective attempts to minimize the total cost of the supply chain network. The second objective attempts to maximize the customer service level (customer responsiveness) in both forward and reverse networks. The third objective tries to minimize the total number of defects of in raw material obtained from suppliers and thus increase the quality level. To solve the proposed model, the non-dominated sorting genetic algorithm (NSGA-II) and non-dominated ranked genetic algorithms (NRGA) are used. A Taguchi experimental design method was applied to set and estimate the proper values of GAs parameters for improving their performances. Besides, to evaluate the performance of the two algorithms some numerical examples are produced and analyzed with some metrics to determine which algorithm works better. In order to determine whether there is a significant difference between the performances of the algorithms, the one-way A‌N‌O‌V‌A and Tukey test are used at 0.95 confidence level. Finally, the performance of the algorithms is analyzed and the results are reported. Al Jadaan, o., Rao, Rajamani, C. R., L. 2008. Non-dominated ranked genetic algorithm for solving multi-objective optimization problems: NRGA. Journal of Theoretical and Applied Information Technology, 2, 60-67. Altiparmak, F., Gen, M., Lin, L., Paksoy, T. 2006. A genetic algorithm approach for multi-objective optimization of supply chain networks, Comput. Indus. Eng. 51, 197–216. Amiri, A. 2006. Designing a distribution network in a supply chain system: formulation and efficient solution procedure, Eur. J. Oper. Res. 171 (2), 567–576. Anne, M., Nicholas, L., Gicuru, I and Bula, O. (2016). Reverse logistics practices and their effect on competitiveness of food manufacturing firms in Kenya, International Journal of Economics, Finance and Management Sciences. Vol. 3: 678-684. Binti, NNI, Moeinaddini, M., Ghazali, JB and Roslan, NFB. (2016). Reverse logistics in food industries: a case study in Malaysia, International Journal of Supply Chain Management. Vol. 5: 91-95. Chan, F.T.S., Chung, S.H. 2004. A multi-criterion genetic algorithm for order distribution in a demand driven supply chain, Int. J. Comput. Integrat. Manufact. 17 (4), 339–351. Davis, PS., Ray, TL. 1969. A branch-and-bound algorithm for the capacitated facilities location problem. Naval Research Logistics; 16: 331–44. Deb, K., Pratap, A., Agarwal, S. and Meyarivan, T. 2002. A fast and elitist multi objective genetic algorithm: Nsga-ii, Evolutionary Computation, IEEE Transactions on, Vol. 6, No. 2, 182-197. Demirel O.N., Gökçen, H. 2008. A mixed-integer programming model for remanufacturing in reverse logistics environment, Int. J. Adv. Manuf. Technol. 39 (11–12), 1197–1206. Du, F., Evans, G.W. 2008. A bi-objective reverse logistics network analysis for post-sale service, Compute. Oper. Res. 35, 2617–2634. El-Sayed, M., Afia, N., El-Kharbotly, A. 2010. A stochastic model for forward–reverse logistics network design under risk, Comput. Indus. Eng. 58, 423–431. Eroll, I., Ferrell, W.G. 2004. A methodology to support decision making a cross the supply chain of an industrial distributor, Int. J. Product. Econ. 89 (2004) 119-129. Fleischmann, M., Beullens, P., Bloemhof-ruwaard, G.M., Wassenhove, L. 2001. The impact of product recovery on logistics network design, Product. Oper. Manag. 10, 156–173. Franca, R.B., Jones, E.C., Richards, C.N., Carlson, J.P. 2009. Multi-objective stochastic supply chain modeling to evaluate tradeoffs between profit and quality, Int. J. Product. Econ. http://dx.doi.org/10.1016/j.ijpe.2009.09.005. Gen, M., Altiparmak, F., Lin, L. 2006. A genetic algorithm for two-stage transportation problem using priority-based encoding, OR Spect. 28, 337–354. Gen, M., Syarif, A. 2005. Hybrid genetic algorithm for multi-time period production/distribution planning, Compute. Indus. Eng. 48 (4), 799–809. Giri, B.C. and Sharma, S. (2015). Optimizing a closed-loop supply chain with manufacturing defects and quality dependent return rate. Journal of Manufacturing Systems, Vol. 35, pp.92– 111. Guillen, G., Mele, F.D., Bagajewicz, M.G., Espuna, A., Puigjaner, L. 2005. Multi-objectives supply chain design under uncertainty, Chem. Eng. Sci. 60, 1535–1553. Huijun, S., Ziyou, G., Jianjun, W. 2008. A bi-level programming model and solution algorithm for the location of logistics distribution centers, Appl. Math. Modell. 32 (2008) 610–616. Jacobs, F., Chase, R.B. 2008. Operations and Supply Management – The core, New York McGraw-Hill/Irwin. Ko, H.J., Evans, G.W. 2007. A genetic-based heuristic for the dynamic integrated forward/reverse logistics network for 3PLs, Compute. Oper. Res. 34,346–366. Krikke, H., Bloemhof-Ruwaard, J., Van Wassenhove, L.N. 2003. Concurrent product and closed-loop supply chain design with an application to refrigerators, Int. J. Prod. Res. 41 (16), 3689–3719. Lee, D., Dong, M. 2008. A heuristic approach to logistics network design for end-of-lease computer products recovery, Transp. Res. Part E 44, 455–474. Lee, D.H., Dong, M. 2009. Dynamic network design for reverse logistics operations under uncertainty, Transp. Res. Part E 45, 61–71. Listes, O., Dekker, R. 2005. A stochastic approach to a case study for product recovery network design, Eur. J. Oper. Res. 160, 268–287. Maosheng, T., Xiaoyun, G., Ling, Y., Haizhou, L., Wuyi, M., Zhen, Z and Jihong, C. (2016). Multi-objective optimization of injection molding process parameters in two stages for multiple quality characteristics and energy efficiency using Taguchi method and NSGA-II, Int J Adv Manuf Technol. Vol. 89: 241-254. Melachrinoudis, E., Messac, A., Min, H. 2005. Consolidating a warehouse network: a physical programming approach, Int. J. Product. Econ. 97, 1–17. Min, H., Ko, H.J. 2008. The dynamic design of a reverse logistics network from the perspective of third-party logistics service providers, Int. J. Product. Econ.113, 176–192. Miranda, P.A., Garrido, R.A. 2004. Incorporating inventory control decisions into a strategic distribution network design model with stochastic demand, Transp. Res. Part E 40,183–207. Pishvaee, M.R., Farahani, R.Z., Dullaert, W. 2010. A memetic algorithm for bi-objective integrated forward/reverse logistics network design, Compute. Oper. Res37 (6), 1100–111. Pishvaee, M.R., Kianfar, K., Karimi, B. 2010. Reverse logistics network design using simulated annealing, Int. J. Adv. Manuf. Technol. 47, 269–281. Rajagopal, P., Sundram, VPK and Naidu, BM. (2015). Future directions of reverse logistics in gaining competitive advantages: a review of literature, International Journal Supply Chain Management, Vol. 4: 39-48. Ramezani, M. and Bashiri, M. and Tavakkoli-Moghaddam, R. 2013. A new multi-objective stochastic model for a forward/reverse logistic network design with responsiveness and quality level. http://www.elsevier.com/locate/apm, 37(4), PP.535–344. Sabri, E.H., Beamon, B.M. 2000. A multi-objective approach to simultaneous strategic and operational planning in supply chain design, OMEGA 28, 581–598. Salema, M.I., Po’voa, A.P.B., Novais, A.Q. 2006. A warehouse-based design model for reverse logistics, J. Oper. Res. Soc. 57 (6), 615–629. Salema, M.I.G., Barbosa-Povoa, A.P., Novais, A.Q. 2007. An optimization model for the design of a capacitated multi-product reverse logistics network with uncertainty, Eur. J. Oper. Res. 179, 1063–1077. Selim, H., Ozkarahan, I. 2008. A supply chain distribution network design model: an interactive fuzzy goal programming-based solution approach, Int. J. Adv. Manuf. Technol. 36, 401–418. Syarif, Y.S., Yun, A., Gen, M. 2002. Study on multi-stage logistics chain network: a spanning tree-based genetic algorithm approach, Compute. Indus. Eng. 43, 299–314. Tavakkoli-Moghaddam, R., Azarkish, M. and Sadeghnejad- Barkousaraie, A. 2011. Solving a multi-objective job shop scheduling problem with sequence-dependent setup times by a pareto archive pso combined with genetic operators and vns, The International Journal of Advanced Manufacturing Technology, Vol. 53, No. 5-8, 733-750. Tsiakis, P., Papageorgiou, L.G. 2008. Optimal production allocation and distribution supply chain networks, Int. J. Product. Econ. 111, 468–483. Uster, H., Easwaran, G., Akçali, E., Çetinkaya, S. 2007. Benders decomposition with alternative multiple cuts for a multi-product closed-loop supply chain network design model, Naval Res. Logist. 54, 890–907. Wang, H.F., Hsu, H.W. 2010. A closed-loop logistic model with a spanning-tree based genetic algorithm, Compute. Oper. Res. 37, 376–389. Yadegari, E., Najmi, H., Ghomi-Avili, M. and Zandieh, M. (2017). A flexible integrated forward/reverse logistics model with random path-based memetic algorithm, Iranian Journal of Management Studies, Vol. 8, No. 2: 287-300.